This is a structure with a square layout and four marble columns supporting the same number of capitals of different shapes, some of which look like those from the basilica. An inscription on the western side of the stone cornice around the Annunciation scene attests that the ciborium was placed in 1272, as ordered by Otto, the Bishop of Poreč. This side of the ciborium is undoubtedly the most interesting, being the most visibly accessible. Here, the Annunciation scene is depicted, the same as the one decorating the Euphrasian basilica's central apse. The different sides of the ciborium host medallions depicting saints with their names inscribed. On the southern side, we find Maurus and Eleutherius, on the northern side, Acolyte and Projectus, while on the eastern side we can find Demetrius and Julian. 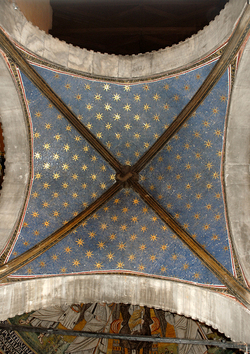 The vault of the ciborium's dome is entirely covered with a light blue mosaic surface dotted with eight-pointed stars. A stone with a relief sculpture of a lamb has been inserted near the keystone. The first stage of the building's construction may be dated back to around 313 AD. Later, the complex was repeatedly reconstructed and totally restored and decorated by Bishop Euphrasius between 539 and 560. 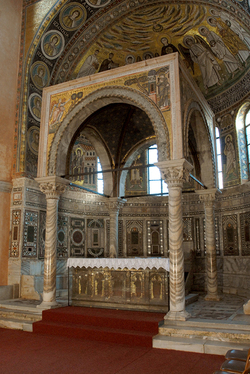 The ciborium was commissioned by Bishop Otto in 1277 and was constructed on the 10th anniversary of Poreč's recognition of Venetian rule. 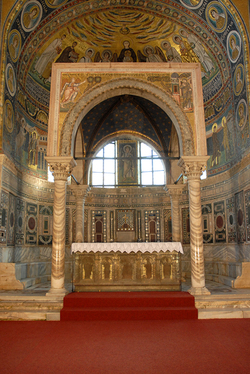 The ciborium's artistic language (sculpture and mosaics) is that of the Venetian craftsmen working at that time in St. Mark's factory in Venice. The marble ciborium, placed in 1277 in the apse of the Euphrasian Basilica, was commissioned by Bishop Otto. This is attested to by the inscription engraved on the western side of the ciborium. The slab supporting the mosaic surface is made of marble. The mosaic was laid with lime mortar on marble supports. On the edges of the halo, certain areas of the saints' faces, in the gowns and features of the individual saints, in the medallion rims. For the shade in the saints' faces and gowns, in certain areas of the architecture behind the figure of the Virgin Mary and the Annunciation. For the background of the Annunciation scene and on the remaining three sides of the ciborium with figurative depictions, in the stars on the dome, on the backdrop behind the martyrs' figures, inside the medallions, and in the area around the inscription in the ciborium dome. For the sky in the ciborium dome, for the bottom near the figures of St. Demetrius and Julian, and in certain parts of their gowns. For the inscriptions with the names of the saints, on the inscription of the Annunciation scene in the ciborium dome. The mosaic is fairly well preserved even though many tiles have fallen off. There are also gaps and integrations which are impossible to date. Pietro Bornia consolidated the figurative areas of all four depictions of the saints, and his assistant Lorenzo Sferco worked on the decorative areas. There are no documents attesting to the restored parts and the work performed. A segment of the ciborium dome was certainly restored, whereas the missing parts were integrated with mortar and painted with matching colours for a seamless look. The right rear corner of the mosaic surface was consolidated with numerous tiles plastered on the mortar bed with the help of small bronze clamps (BERNARDI 2006, I mosaici della basilica eufrasiana pp. 37, 228).